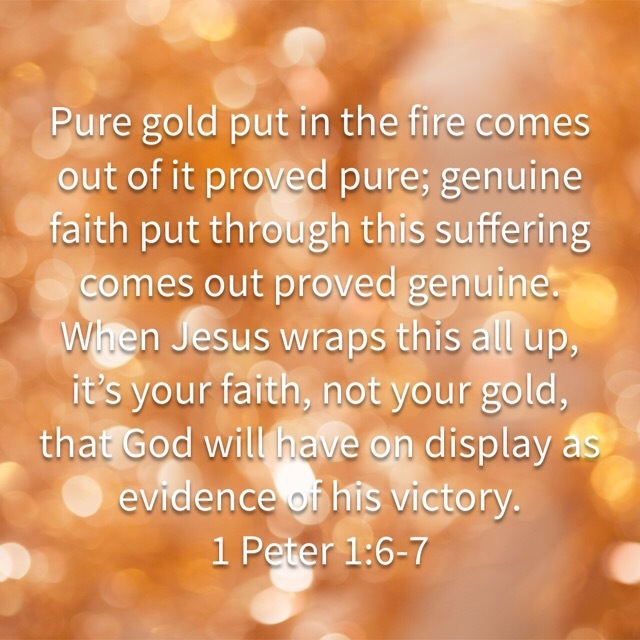 Your faith, your relationship with Jesus, is more precious than the finest gold. It will last longer than your job, your goals and your body. It is the inside eternal life that sustains you through the trials of the outside temporary life. The same fire that destroys the wood purifies the gold. God will use the very thing that is discourging you to purify you. He will use the disappointment you are experiencing to make wrong motives and false beliefs rise to the surface so He can skim them off. You have a promise here that God knows where you are, knows how to use it do an important work in you and that you will come out of it shinning. Hold onto God during this season because He is most certainly holding onto you. “The same fire that destroys the wood purifies the gold.” Very good words to for me to ponder this morning. Thank you!